Christmas 1989. The horrendous day in history when Pops TNUC ran out on the little Manimal and forgot to leave a single gift under the tree. Not just any gift, but the most massive and triumphant of all toys: the action figure PLAYSET, or fortress as we like to call them. Ever since Uncle T laid eyes on one of these sacred and gargantuan structures, he drooled over having one. Even the walls of his bedroom were plastered with pictures ripped out of the Sears’ holiday catalogue of these giant playsets. So when Christmas morning of 1989 came around and hopes were at their highest, ol’ Pops grabbed him by the shirt and said “smoke up little T!” and handed him a carton of cigarettes. Then he took off on his Harley, abandoning the family to join a naked biker cult up in the mountains. In attempt to look past these dark memories and reflect with some shred of positivity, today we’re showcasing Uncle T’s top 6 most wanted FEROCIOUS FORTRESSES! #6 SuperNaturals: Tomb of Doom! Synopsis: This ancient tomb held the mysterious entrance to the world of SuperNaturals. 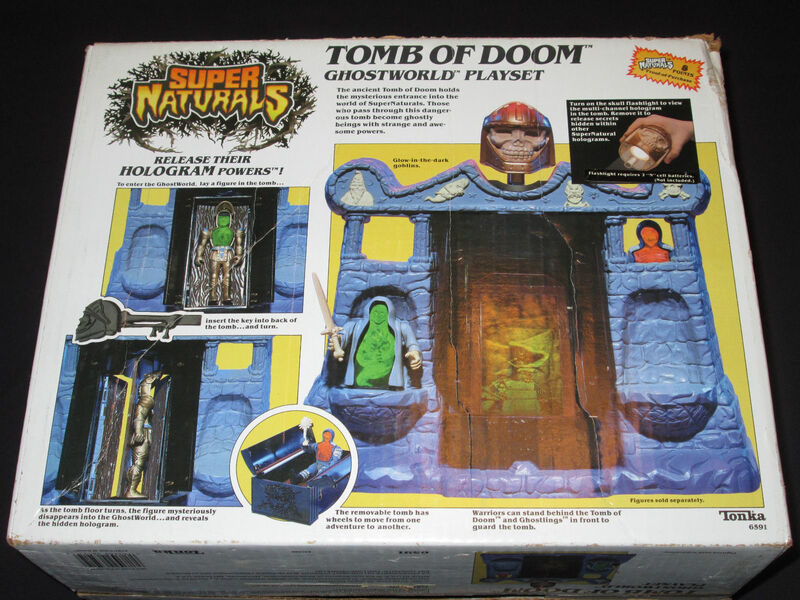 To enter the “Ghostworld”, you laid your figure in the tomb, then inserted the key to make the figure disappear and also reveal a hidden hologram. The Tomb was also a stellar place to keep your SuperNatural Ghostling figures (little cloaked spirits, example here) on guard from from your sister and hamster. 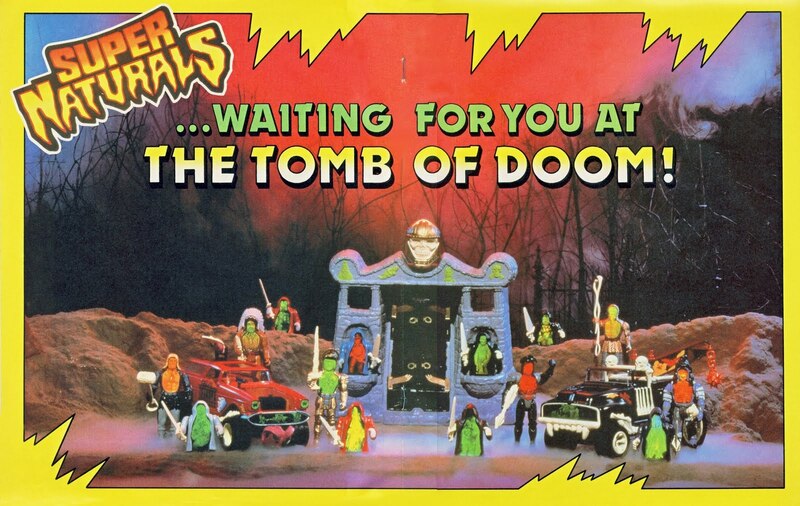 Creature Features: Revolving tomb floor (on wheels for moving), skull flashlight, glow-in-the-dark goblin art. 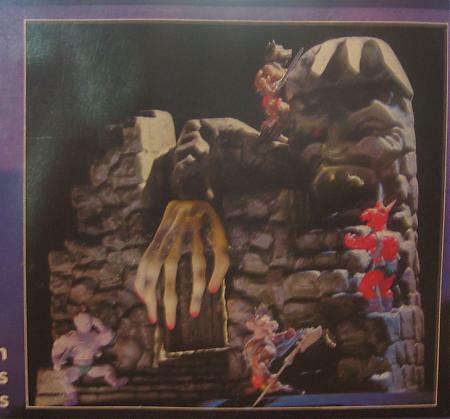 Synopsis: Little is known about the Monster Castle except that it was manufactured by a company called “Eco” and it doesn’t have ties to any known toyline. Rumors spread that it was a prototype playset from the Galaxy Warriors toyline because the back of the box featured a few of their figures. But from what I can gather that wasn’t true. The obscurity and simplicity of this fortress is what I really dig. Plus it reminds me of a funhouse/spookhouse that you’d see at a carnival or fair! Creature Features: Who knows. There could be trapdoors or something in the back. DYING to know if that dangly hand does anything but just flop around. 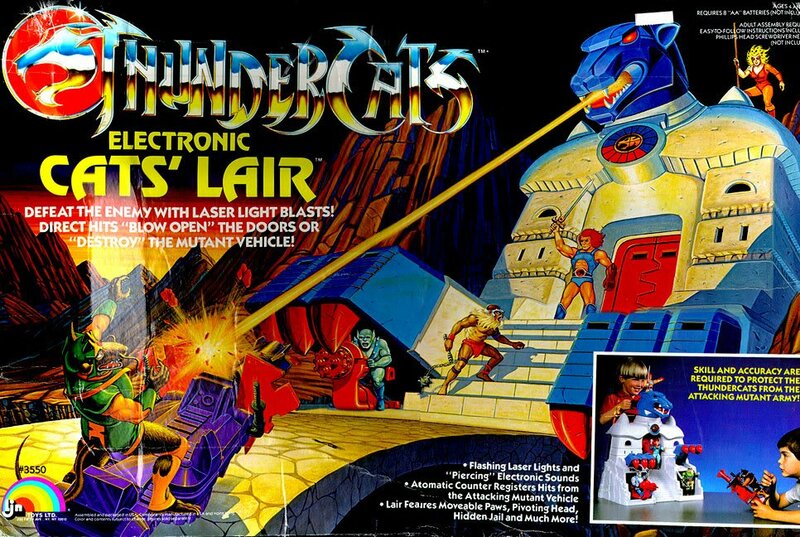 #4 Thundercats: Electronic Cat’s Lair! Synopsis: In the series, this mega fortress was carved out of a natural granite mountain to house the Thundercats and provide an indestructible sanctuary to help them fight off Mumm-Ra and his mutant pals. The toy fortress itself stood 20 inches high, with a pivoting cat’s head sitting on top of a pearly-white playset, ready to destroy. The ‘electronic’ part was for going toe-to-toe with your friend (the enemy) in a battle to score as many direct hits as possible against each other. Creature Features: Flashing laser lights, piercing sounds, trap doors leading to underground jail to trap enemies, moveable cat paws, pivoting head. 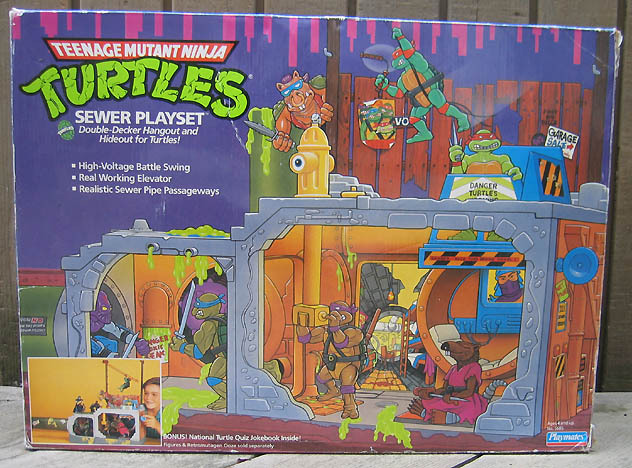 #3 Teenage Mutant Ninja Turtles: Sewer! Synopsis: Don’t tell our mutated amphibians that Krang’s Technodrome is technically the mightier fortress of the TMNT universe. To them, there’s no place they’d rather spend scarfing pizza, meditating and hearing stories from their rat sensei than the sewer lair. 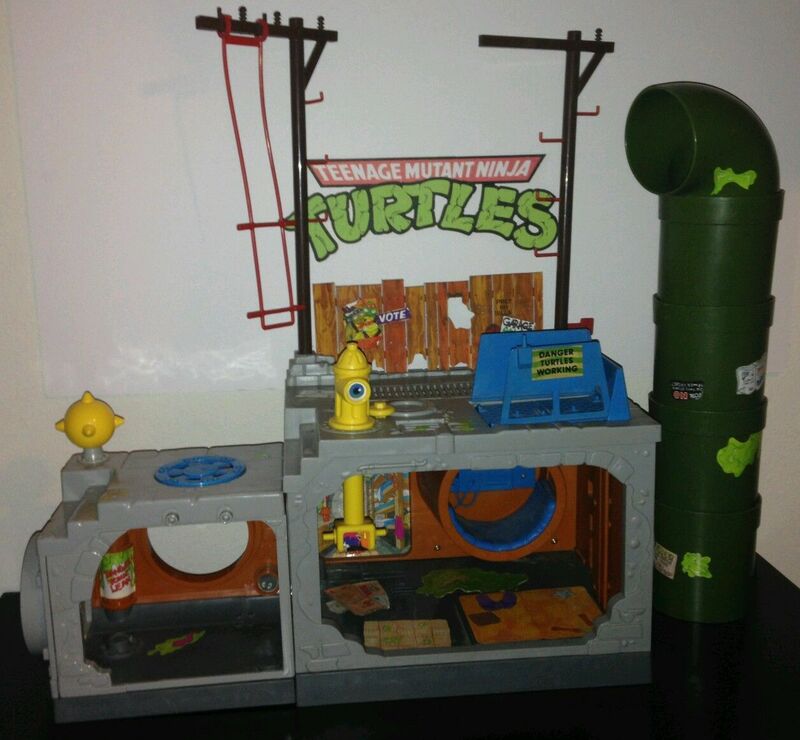 The playset was released during the height of Turtles mania and was an absolute crucial piece for any collector. Creature Features: It’s double-decker layout featured an upper “street” level (fire hydrant, manhole cover, telephone poles for hanging) and underground level featuring a punching bag, sewer pipes, elevator and periscope (which attached to the hydrant!). 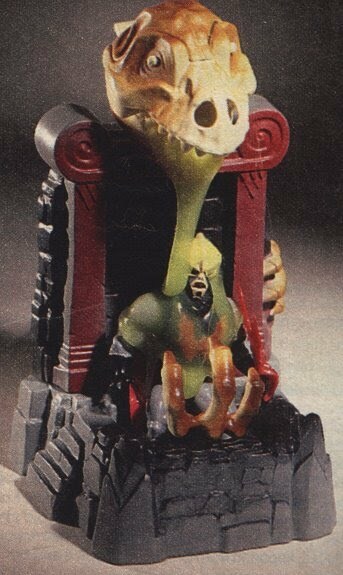 #2 Masters of the Universe: Castle Grayskull! Synopsis: Call me typical, but there’s no way this wasn’t making this list. 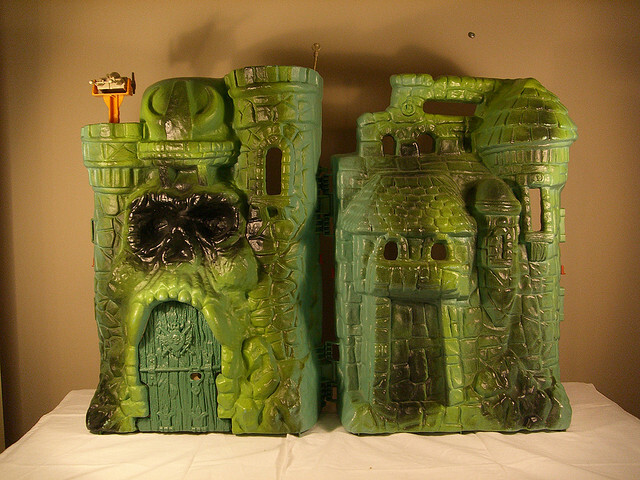 The one, the only…the grandaddy and probably most memorable of them all: CASTLE GRAYSKULL. 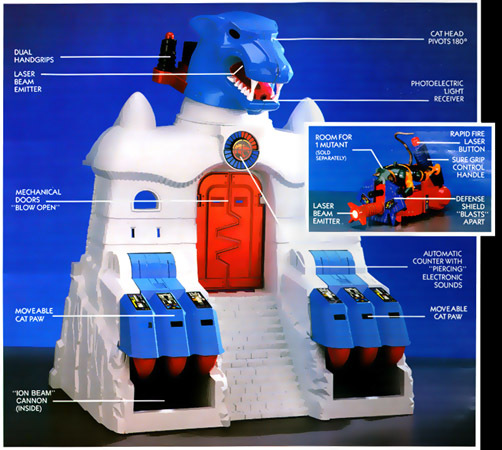 This powerful fortress of mystery and sorcery had more beastly features and details than any kid at the time could possibly imagine. The frontside was beautifully detailed with a mouth-like entrance and jaw bridge which simulated teeth and a tongue. The backside was the interior of the castle which included a series of rooms, a dungeon, throne hall, armory, elevator and “supercomputer”. The playset closed up like a briefcase and was totally durable with help from a cavity which worked as a handle for carrying. 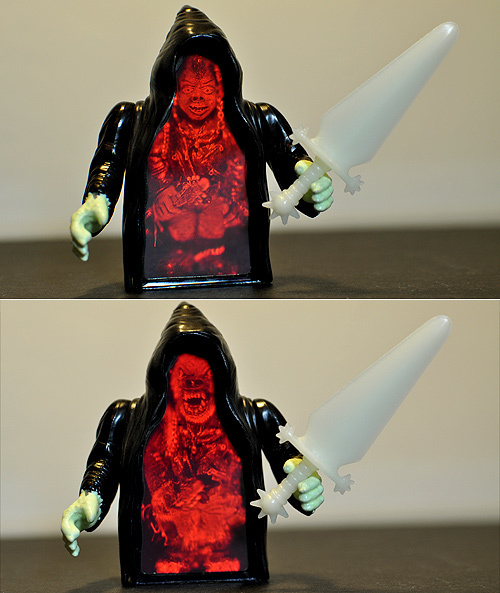 Any kid with a handful of He-Man figures and an imagination would be busy for days on end with this iconic toy. Creature Features: Working jaw bridge that lowered and locked using power sword as a key, ancient throne/secret lever to release trap door, weapons rack, working elevator. 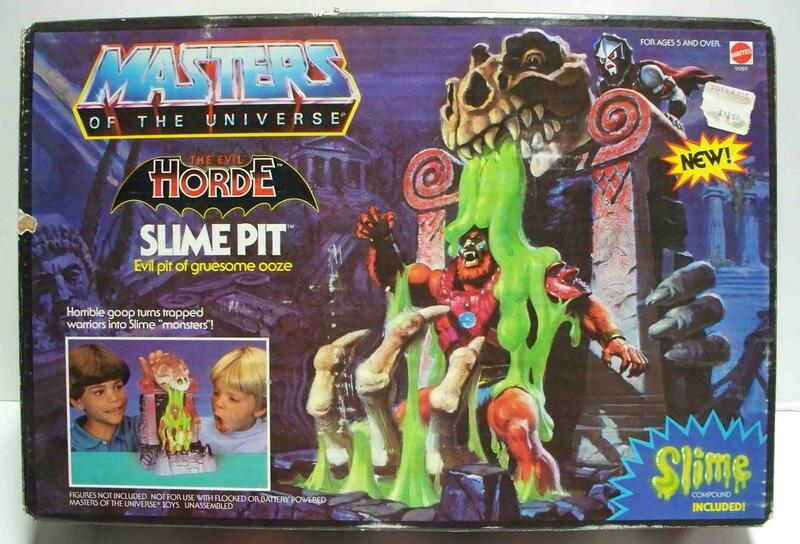 #1 Masters of the Universe: Slime Pit! 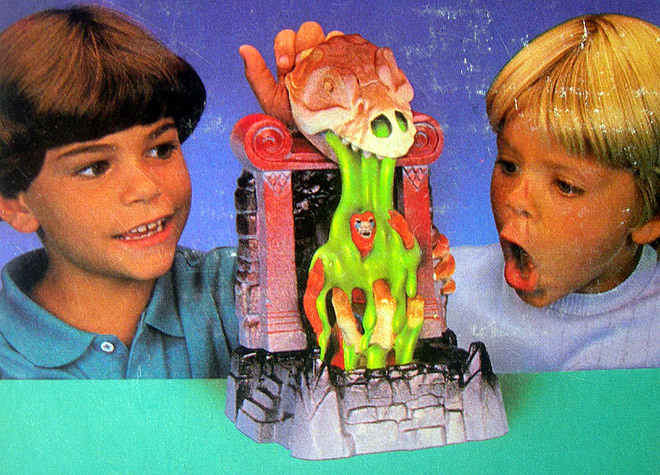 Creature Features: Moveable dino skull and SLIME ACTION. 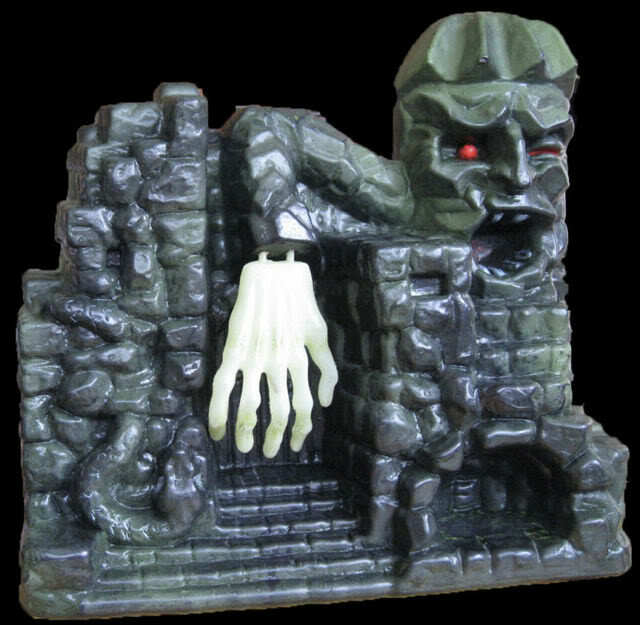 To get as close as possible to the actual experience of this thing, head over to Slime Pit historian Dinosaur Dracula’s website. Thanks for sticking around to the end of our countdown! What FEROCIOUS FORTRESSES would you hold as essential? Share em’ on here or on our Facebook page. 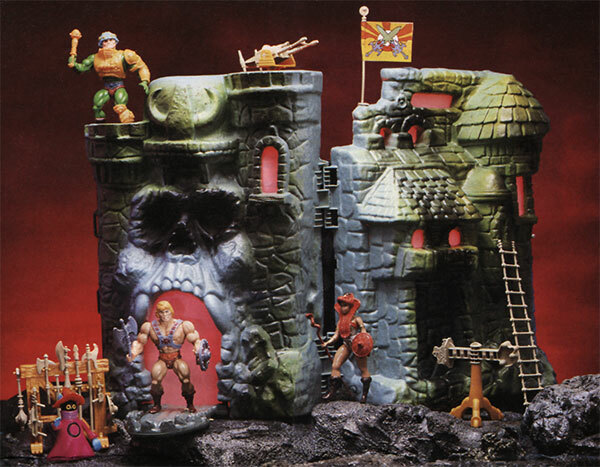 I owned a Castle Grayskull, best Christmas ever! But no love for Snake Mountain? The microphone man!!! The microphone!!! thanks Uncle T for reminding us who we once were and who we remain at heart, let’s make this happen. What a cool post man. Now you got me looking through all the other types of fortresses out there, or bases/buildings. Ghostbusters had the oh-so-awesome Firehouse, and G.I. Joes had their bad boys as well. I would be sold at $500! I remember there were at least two different boxes for Snake Mountain. One said “Spirit” and one said “Voice.” There may have been other minor differences. Not sure which came first.